We offer children science in our "lab" of Golden Gate Park! Only half a block from our campus. Activities are based on real life experiences. Welcome to Shalom School where our vision is to support families in developing the minds, hearts, and souls of our young children. At Shalom School, we create classrooms of curious learners that are developing critical thinking skills, socially appropriate interactions, and Jewish pride and love for living a Jewish life. Developing individual children's creativity in art and music, sport and outdoor play are all included in the healthy, well-rounded education and care each child receives at Shalom School. We serve nutritious, healthy, homemade meals and snacks while observing kashrut. 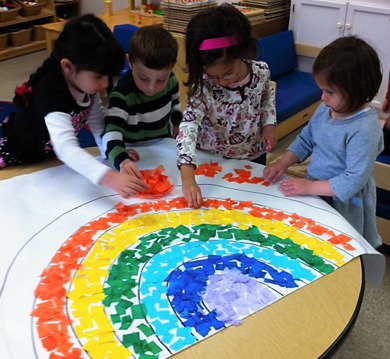 Children are encouraged to participate in a variety of activities, including music, dance, and creative arts. The children attend local educational field trips to the fire departments, police stations, grocery stores, museums, parks, elderly care homes, playgrounds, and gardens. The children have opportunities to socialize through classroom participation and interaction with others. We have created a nurturing learning environment that encourages innovation, invites creativity, and inspires versatile thinking. Language is one of the most important tools of our lives, and our program offers children the opportunity to learn with our experienced bilingual teaching staff.